The 2017 Topps Archives Signature Series Postseason Edition Baseball checklist visits the point in the year when legacies are cemented and MLB stars are born. Each box contains one signed buyback with 20 boxes per case. Most collectors know the drill at this point, but Topps acquires past card releases which are then signed and reissued under the 2017 Topps Archives Signature Series banner. Although an earlier Signature Series release for 2017 deals with active players, 2017 Topps Archives Signature Series Postseason naturally covers prior October glory in signed form. It is also specific to retired players. Every on-card autograph is serial numbered, foil stamped with the brand logo, and encased. In addition to the standard signed buybacks, 2017 Topps Archives Signature Series Postseason Edition includes Legend Autographs, Dual Autographs and Autographed Relics. While no specific cardboard timeframe was provided, the sell sheet features cards from the 1980s, 1990s and 2000s. 67 subjects. The full breakdown was not provided. Players can have multiple card versions with different print runs. All cards stamped, serial numbered and slabbed. Good: Only on-card autographs; some big names included; box price is moderate. Bad: Top-heavy checklist with many low-value names to fill it out; biggest chases have lowest print runs; needs more HOF players. The Bottom Line: Although quite comparable to Archives Signature Series Active, the Postseason Edition comes in at a lower level. The overall checklist is weaker, resulting in lower box prices, but this makes an already risky product even more of a gamble. By no means is it to be avoided, but unless you are chasing a one-of-one, buying singles is probably the better move. With a buyback autograph set, there is not much to discuss with regards to design. The delivery is at least clean, as the hard-signed card is serial numbered, stamped with the brand logo, and sealed inside a magnetic case. The real question is what period the card comes from, and the condition of the card. Although the 2004 card from our box was in okay shape, we heard complaints about rough cards. Just from the sense of being so recent, I'd prefer it if no buybacks came on cards from the last five years or so. 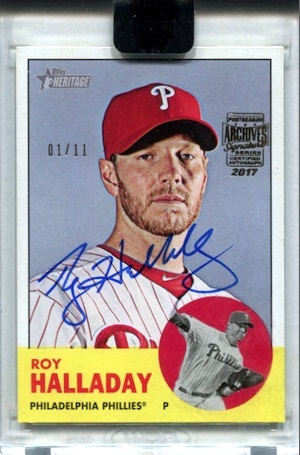 Whereas the Active Edition product could entice you with current superstars, and the potential of rising stars, the 2017 Topps Archives Signature Series Postseason Edition checklist is a known entity as all are retired. The players either are popular and have value, or not. Obviously Jeter is a huge chase factor, but all his cards are one-of-ones. Plus, you have Ripken, Hank Aaron, Rickey Henderson, and Sandy Koufax. Again, most of these are very limited, with print runs largely under 10, and many being one-of-one versions. On the other hand, there are multiple names within the group of 67 that don't come close to the box cost. This is where a clear breakdown of the cards would help since there is no way of knowing just how many versions a player has until weeks (or months) after release. For $35-40 (at the time of this review), you can purchase one of these boxes knowing a signed card is inside. Even with the very basic subject list, you can also see how risky it is. Make no mistake, there are some huge hits, with many cards (such as the players mentioned above) selling into the hundreds. At this low box price, that is not all that common, and a win can feel extra sweet. But, more likely, you will end up with a $5-10 autograph. Even at around $35 per box, value is moderate, at best, and if you pull some duds, it will feel like chasing value in this set is almost impossible unless you get very lucky or have cases to open. I guess it boils down to your own approach, but I feel that this is a great comparison to buying a lottery ticket. You make your purchase knowing you won't win, but still there is a small bit of hope. The difference is that you walk out of it with something, and even if the monetary value is weak, it could still have collecting value for you personally. The card from our review box (Tony Womack) was a dud on both counts. That is also an advisable way to go about deciding if you should open a box or two. 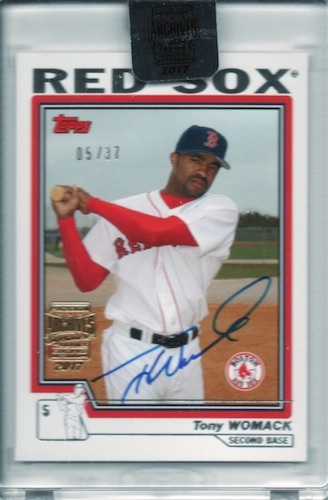 Would you be okay pulling an autograph for Womack, Charlie Hayes, or Keith Foulke for the chance at something great? That is the tradeoff here, and the fun coincides largely with the result. Naturally, the name in the box could have been much better, but the experience was still somewhat enjoyable. 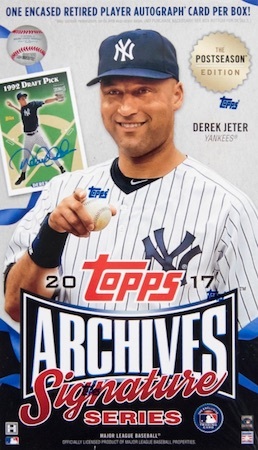 See full details about other 2017 Topps Archives Signature Series sets. This list of names is ugly. Couldnt imagine paying $40-50 and getting a Tony Womack auto. I think the chase of trying to land a Jeter or some notable fresh HOFer would be a giant letdown to getting that Womack or a Tim Wakefield. No offense to those who would like those guys. But for $40 you could likely find 5-10 TTMs of those guys on actual 1990s junk wax. If you have experience in this Hobby then you would understand that not every hit can make you money or even half your money. Topps needs to make money too. Im only giving it four because some of the cards I pulled were damaged on the corners even though the come in hard cases. I did though buy three boxes and out of all three I pulled an Andy Petite, Alex Rodriguez and a Derek Jeter. All numbered 1/1. Wow! This is the laziest release from Topps, yet. As a Juan Gonzalez fan, I am excited to see him on any checklist, but Topps is doing nothing but tanking the market with signed, stamped, beat-up base cards made to look like treasures. Why flood the market with 80 dinged-up 1990 Bowman RC’s, and 1/1s made from base cards from 2016 Tek? This release makes Topps Tribute look like the Holy Grail. And one card per “box”? Total joke. I know a few people that have pulled 1/1’s of Trout, Jeter, Ripken, but eventually there are going to be so many of these auto’s that they will be watered down..
What a ****** box to buy…. Didn’t do my research and bought one box…. One card?!? Lol the box def doesn’t say “only one card inside”. At a quick glance you would think there will be one signed encased card and some packs to open. 40 bucks after shipping and all for one card?!? Lol total garbage. I buy a lot of cards and boxes to open, this will be my only one of these. I would rather take $40 and watch eBay for a signed relic card of someone in the HOF of the past. This is a total rip off in my opinion. And I don’t reckon a good player would have made me feel much different. Should have reviewed and paid better attention I suppose. Oh well… All I can say is this is one ****** *** “hobby box” lmfao total ******* sham. I dont really collect baseball cards. I’m a football guy and when I bought a box, the guy running the store said they have pulled 8 one of ones already and the guy ahead of me bought 3 boxes, hit a 1 of 1 and a hank Aaron /4. I bought the last box and hit a Sandy Koufax /4. Overall, its kinda risky but I like it. This was the best $45 I spent ever. I bought 1 spot into a group break tonight and everyone was guaranteed 1 card and I landed a 1 of 1 Juan Gonzalez Bowman Chrome Rookie Reprint Auto. So far, I hit a Sandy Koufax #2/4 and a 1 of 1 Juan Gonzalez. I dont really collect baseball but I kinda love this product for the price. Bought 3 boxes first 2 yielded Ken Hrbek and Andruw Jones. I said ok i will do ONE more. Derek Jeter 98 Finest 1/1 Auto. As i die hard Yankee Fan i am more than happy. For the price 40-45 bucksits a low risk high reward, it beats spending over 100 bucks on a box and getting 1 dollar worth of hits. I see that Topps is pulling some shenanigans with their numbering system on some of these cards to drive up the prices. I have seen several cards of players indicating that they were a 1 of 1 card yet the same card is out there with a different total of cards made printed on it. I picked up an ’87 Topps Traded Ron Cey Oakland A’s card that was supposed to be 1 of 8 yet I saw another auction on ebay where the same card was marked 12 of 24! I also saw a Derek Norris card marked 1 of 1 yet I have the same card marked 18 of 45! And there have been several other cards done the same way, especially the so-called star cards. Looks like Topps is BSing collectors hoping to drive up prices eh? 2017 Topps Archives Signature Postseason BOX 1 Auto (Derek Jeter Aaron Koufax)?